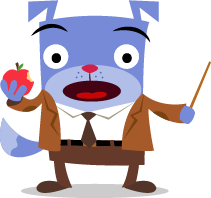 When teaching your students about word parts, be sure to explain why it is essential to learn the definitions of prefixes, which will help them to decipher unfamiliar words. The definitions can become clues to figure out the meanings. Give a list of words with a certain prefix, then challenge your child to add more words to the list. Discuss meanings and how the word changes when the prefix changes. When teaching your students about word parts, be sure to explain why it is essential to learn the definitions of prefixes, which will help them to decipher unfamiliar words. The definitions can become clues to figure out the meanings. Give your class a list of words with a certain prefix, then challenge them to add more words to the list. Discuss meanings and how the word changes when the prefix changes. Understanding prefixes is a key component of learning the meaning of unfamiliar words and building vocabulary. 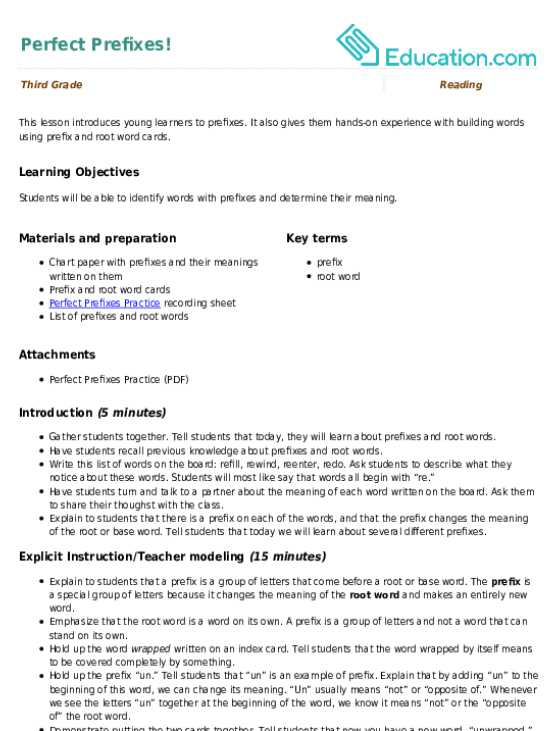 Use this resource to study the prefix con-. Understanding prefixes is an important part of learning the meaning of unfamiliar words and building vocabulary. 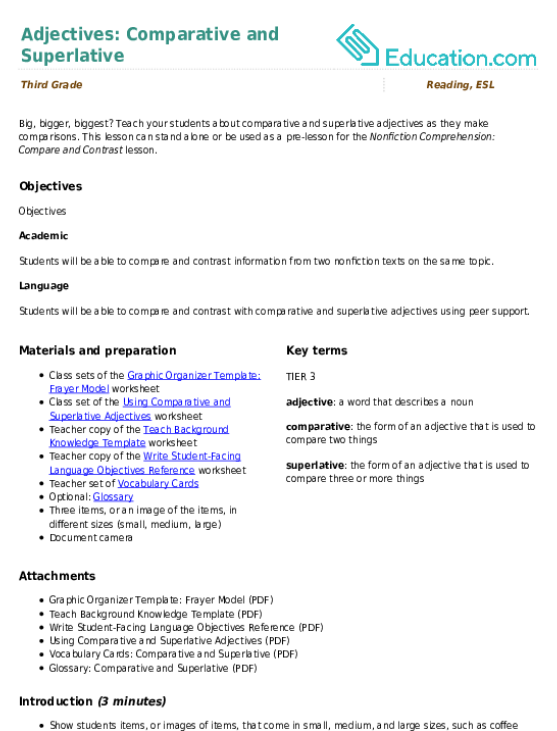 Use this resource to study the prefix com-. Get your child excited about geometry by teaching the names and characteristics of quadrilaterals. Provide your child with a small poster that contains all the shapes and their names. This is a great way to familiarize your child with 2-D shapes. 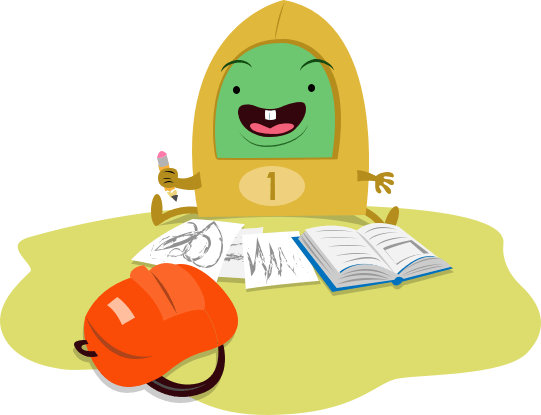 Get your students excited about geometry by teaching them the names and characteristics of quadrilaterals. Provide your students with a small desk poster or display an anchor chart in the classroom that contains all the shapes and their names. This is a great way to get your students familiar with 2-D shapes. 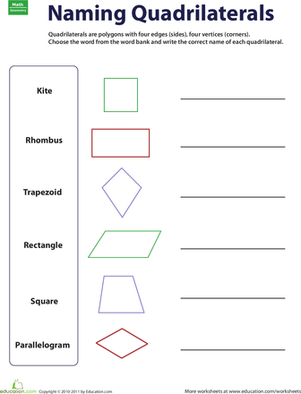 Help your third-grader learn to recognize quadrilaterals with this geometry worksheet. Do you know your quadrilaterals? Learn how to identify five different types of quadrilaterals and put your new knowledge to use with a few practice problems. 4 lines make a quadrilateral! Help your child make various shapes with the dots in this worksheet. 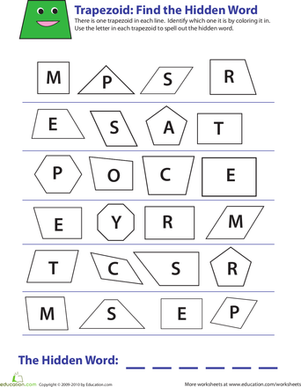 In this 3rd grade geometry worksheet, your child will practice identifying parallelograms among other shapes and will color them in to find a hidden word. 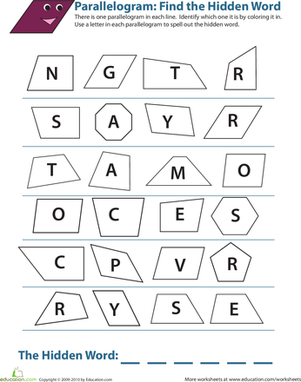 In this 3rd grade geometry worksheet, your child will practice identifying trapezoids among other shapes and will color them in to find a hidden word. This exercise will deepen students’ understanding of 2d shapes by exploring examples with shared attributes. Are You Connected to Me? How are quadrilaterals connected? 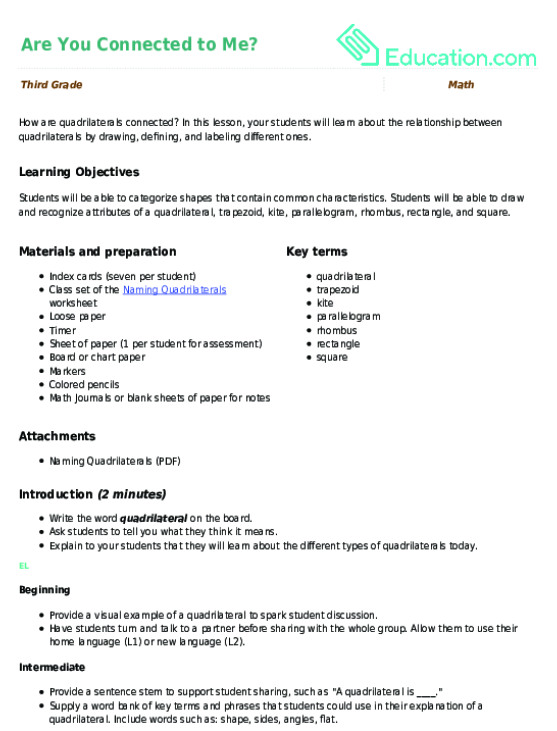 In this lesson, your students will learn about the relationship between quadrilaterals by drawing, defining, and labeling different ones. When readers compare and contrast, they are critically thinking and making connections about a text. Give your child opportunities to activate and extend prior knowledge through reading comprehension activities. Use science and social studies topics to give your child practice finding similarities and differences. Offer graphic organizers, such as a venn diagram, to record information. When readers compare and contrast, they are critically thinking and making connections about the text. Be sure to give students opportunities to activate and extend their prior knowledge through reading comprehension activities. Use science and social studies topics to give your students practice finding similarities and differences. Offer them graphic organizers, such as a venn diagram, to record information. 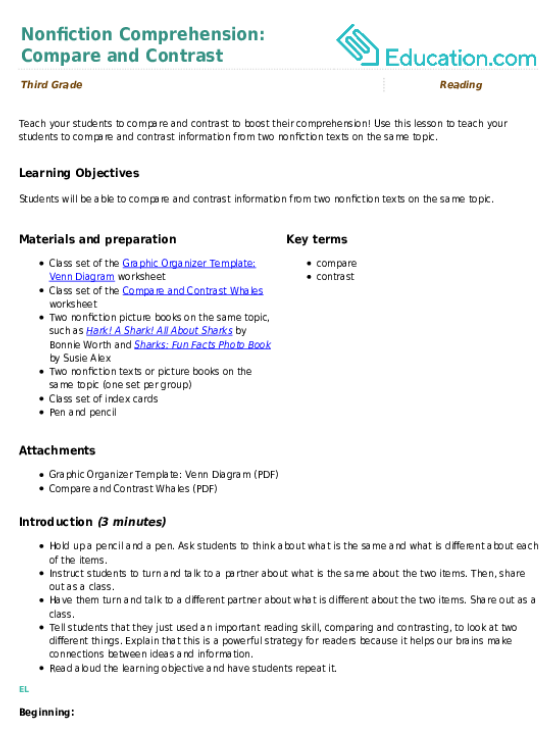 Use this resource to get your students comparing and contrasting information from two short texts. If your students struggle with how to compare and contrast texts, this worksheet can be used for reteaching or extra practice. 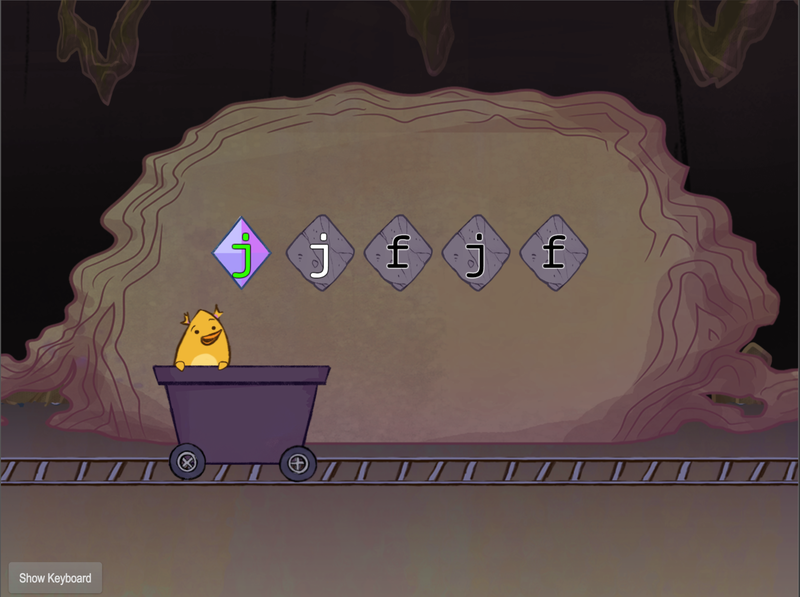 Be sure to expose your child to cursive handwriting and touch typing instruction. Cursive handwriting and typing are important life skills for young learners. Much of our lives operate through the world of technology, so your child will be at an advantage if they can type with ease. Also, the ability to read and write cursive is often needed to read historical documents. Be sure to expose your students to cursive handwriting and touch typing instruction. Cursive handwriting and typing are important life skills for young learners. Much of our lives operate through the world of technology, so students will be at an advantage if they can type with ease. Also, the ability to read and write cursive is often needed to read historical documents. 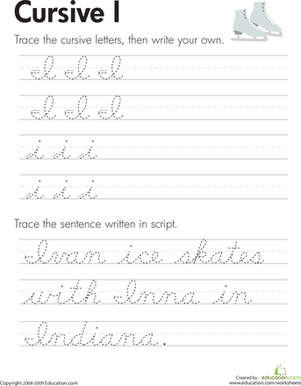 Write the cursive I with ease in this cursive I worksheet. 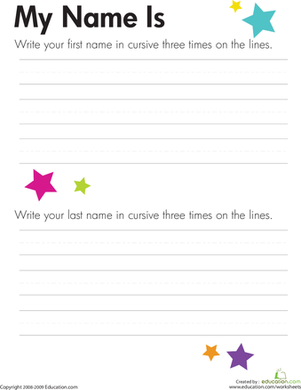 Loop, scrawl, and write your way to a perfect cursive I with this cursive I worksheet. 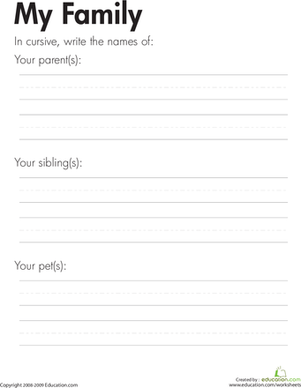 Kids practice writing in cursive the names of close family members (and maybe pets, too) on this third grade writing worksheet. Kids practice writing their first and last names in cursive on this third grade writing worksheet. 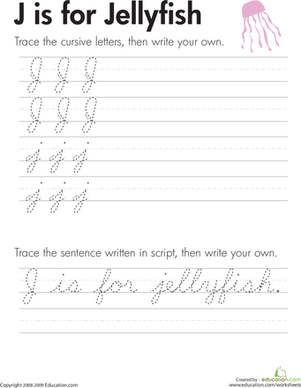 Kids practice writing capital and lowercase "J" in cursive on this third grade writing worksheet by tracing the letters, then writing their own. 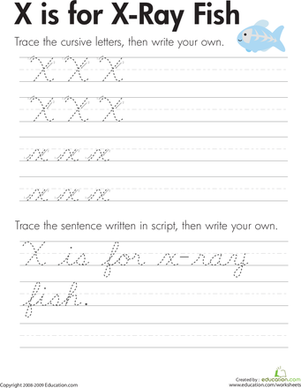 Kids practice writing capital and lowercase "X" in cursive on this third grade writing worksheet by tracing the letters, then writing their own.